Cobb Salad Dip – A creamy ranch dip covered in your favorite toppings from a traditional cobb salad. The perfect appetizer for game days, summer parties, and barbecues! I don’t know about you guys, but my July is JAM. PACKED. I’ve got visitors staying with us every single weekend this month. I love hosting company so I am excited to have a constant revolving door this month. But I also gotta make sure to have enough food for my guests. Therefore, I’ll be even more of a regular at my local Kroger as I try to keep my fridge constantly stocked. To make sure my produce stays perfectly fresh this month, I am using my new favorite storage containers from Rubbermaid® FreshWorks™. I first learned about these through my mother-in-law who is OBSESSED with them. She kept raving about them over dinner one night so when we finished eating, we immediately went and bought a couple for me at to try out at home. And she wasn’t kidding! My produce lasted wayyy longer than normal (up to 80% longer*) through its Patented FreshVent™ Technology, which really helped me out because I don’t have time to keep going back to the store when my lettuce gets limp or my strawberries begin to get mushy. So how do these produce savers work? The FreshVent™ technology allows additional oxygen in, creating the optimal environment to maintain fresh produce. And then there’s the green Crisp Tray™ on the bottom that keeps produce elevated above moisture to prevent premature spoiling. Because I have crisp lettuce available to me for most of the month, I am able to make this incredible Cobb Salad Dip for each one of my guests this month. It’s one of my favorite dips that is PERFECT for summer weather since it’s a cold dip. Hot dips are yummy too, but sometimes you just want something cool and refreshing rather than warm and heavy. I first had this dip when a friend of mine brought it to our football party months ago. Literally after just one bite – JUST ONE – I fell deeply in love. It has all the flavors and textures of a cobb salad but in an easy-to-serve dip. I’m talking crunchy bacon, tangy blue cheese, creamy avocados, juicy tomatoes, and, of course, crispy lettuce. You can serve with corn chips or tortilla chips but corn chips are my absolute favorite with this dip because of the extra crunch. This dip was one of the first things to go at the party so I know it’s going to be a hit with all of my guests this month. I’ve made it a couple times this summer for my husband and I to enjoy and it even got him to enjoy blue cheese. What a miracle! I never thought I’d see the day! You can make this dip up to 1 day in advance. However, I advise that you add bacon and avocado right before serving so the bacon doesn’t soften and the avocado doesn’t turn brown. Since this is a layered dip, I suggest serving in a flat, even surface, like a pie pan, which is what I used. You can also use a square baking dish or something similar. I wouldn’t recommend a bowl, however, since it will be tough to get all the layers in one bite because of the rounded bottom. Make sure the lettuce, tomatoes, avocado, and bacon are chopped in bite-sized pieces so they fit on a chip. You don’t want your guests to take a scoop of the dip and then realize there’s no way they’re going to be able to chew everything. Alright, guys. That’s all there is to this dip! Super simple right?! Make sure to pick up your Rubbermaid® FreshWorks™ containers at Kroger to keep your lettuce crisp, just like I did. You can find them easily in the food storage aisle. And, while supplies last, you can get $2 off your FreshWorks™ through Ibotta! Oh and in case your looking for recipe inspiration and more information on FreshWorks™, check out their site here. These containers have been life-changing for me and I know they’ll be for you too! Make sure to let me know how they’ve made a place in your fridge by commenting below! A creamy ranch dip covered in your favorite toppings from a traditional cobb salad. The perfect appetizer for game days, summer parties, and barbecues! Stir cream cheese, sour cream, and packet of ranch seasoning together in a medium bowl until combined. Spread into the bottom of a pie pan. Top with romaine lettuce, diced tomatoes, corn, shredded cheddar cheese, diced avocado, crumbled bacon, and blue cheese crumbles. Serve immediately with corn chips. If serving later, place in fridge but wait to add bacon and avocado right before serving. cobb salad is awesome in taste and i also love to eat with making at home. This looks so delicious! I can’t wait to try it!! Oh yum, this looks absolutely delicious! This looks so yummy. Love a good dip! making it very soon. This would also be great to bring to a summertime BBQ. For sure! Hope you enjoy it! Oh my goodness! I need to save this recipe! I LOVE cobb salad and this would be the perfect appetizer or salad for the summer! Yum! I love cobb salad so I’m sure I’ll love this dip! What a great idea! I love Cobb Salad – def need to try this out! That’s what I call a dip! It’s awesome that you’ve made a salad into a dip. What a perfect idea. I would love to give this a try. This looks seriously delicious! Perfect summer “salad” dip. It has the word salad in it so we can’t feel guilty, right?! This looks amazing! I need to try it out at our next friend gathering. Exactly! I like your thinking! I love cobb salad, I’m definitely going to try this dip. Looks amazing! I agree! Avocados are the best!! My, oh my! This is such a smart idea and tasty looking dish. I’ve never thought to break down a salad into a dip. The family will be loving this-and how genius to use the scoops to really get in there! YUM! I pinning this one. Aw thanks so much! Those chips really bring it all together. Highly recommend them! Whoa this looks amazing. I can eat this all summer! Our summer is packed as well, which I think is why it’s going by so fast (noooooo). PS: We love rubbermaid containers our fridge is full of them! Ah I know right?! How is it already July?!?! And so glad you agree about this dip and the Rubbermaid containers! This looks amazing! I love cobb salad, so I know I would love this, too! This looks soooooo good! I think I could eat this all day every day! Thanks! Me too! Me and my husband almost devoured the whole thing on our own! Cobb salad in dip form?! I love this idea – can’t wait to try it out! This looks insanely amazing! I have to try this out this summer! Looks super yummy! Perfect for summer day. Thanks for sharing! I love this idea! I could probably eat the whole thing myself! This dip is so droolworthy. I will be adding this to a list of upcoming recipes I’ll be making! And those containers are needed in my house like NOW!! Yes! I hope you love the dip and the containers! This dip looks fantastic!! I love Cobb salads so this will be perfect for me! I might actually be more excited about those storage containers though – I hate when my fruit goes bad! Ugh me too! Since it’s just me and my husband, we take a while to go through a quart of strawberries or a head of lettuce. So these containers help it all last longer! this post is making this preggo hungry! looks absolutely delicious and refreshing — perfect for BBQ’s too! Yay! I am glad this dip passes the test! This looks amazing! I love the combination of ingredients. I’m having friends over this weekend and I’m adding this to the menu! Yay! I hope they love it! Cobb salad dip-brilliant. I’m having a party in a couple of weeks. I think I’m going to try this! oh my! You turned my favorite salad into a dip! Very nice recipe, definitely saving! Cobb is not a style of salad I’ve tried yet but I’ll definitely try this one. Definitely going to tell my wife about this rubbermade containers! Thanks for this post! I think you’re gonna love it! And your wife is gonna be obsessed with these containers! Woohoo! You’re gonna love them both! 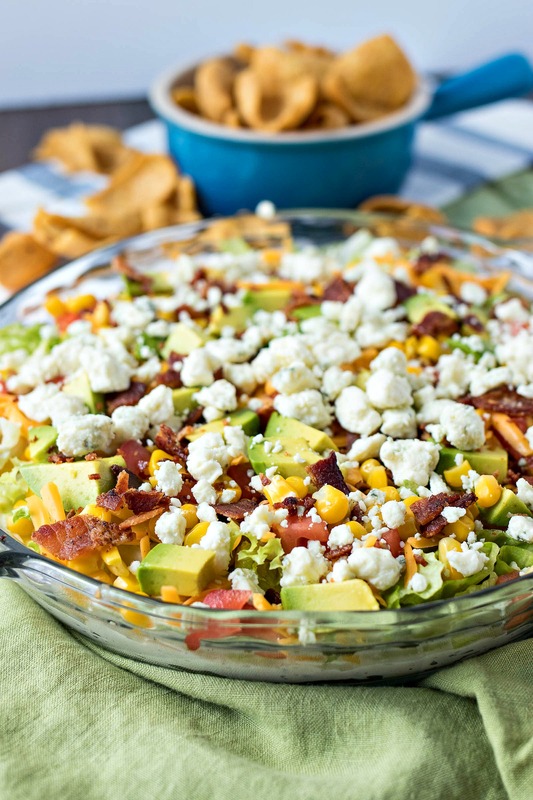 this looks so amazing, I LOVE a cobb salad, plus Im a big fan of anything that can dip! Me too! Dips are the best!